Before I launch directly into the history of agriculture, I want to spend a post citing my sources. Nearly all of the information I'll discuss later comes from three books, each of which is a fun read and chock full of fascinating information I didn't have time to include in this lunchtime series. The books also provide more in depth evidence for each of the assertions I'll make in the following posts --- I've glossed over certain bits of data to keep the posts short, sweet, and to the point. To paraphrase an old folk song, if you want anymore you can read it yourself. Diamond, Jared. 1997. Guns, Germs, and Steel. W.W. Norton & Company, New York. 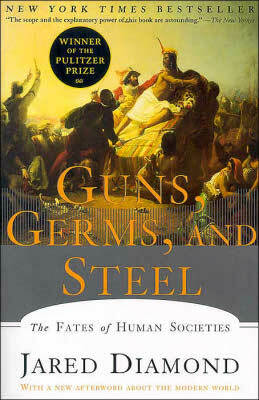 Guns, Germs, and Steel is a well-researched and intriguing look at why Europeans and Asians now largely rule the world. Leonard, Jonathon Norton. 1974. 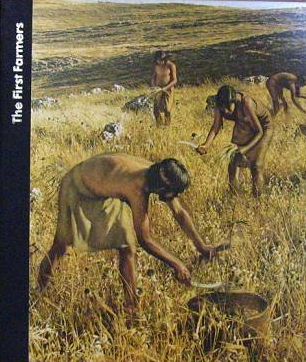 The First Farmers. Littlehampton Book Services Ltd. The only flaw in The First Farmers is the book's age. Presumably, some of the individual facts are a bit out of date, but the book is still a very good introduction to the advent of farming, focusing primarily on the Fertile Crescent. It's easy to read and full of beautiful photos, but at the same time is clearly based on specific scientific studies. Manning, Richard. 2004. Against the Grain: How Agriculture Has Hijacked Civilization. North Point Press, New York. This book shocked me by parallelling all of the conclusions I had come to on my own from previous reading. Very nice of the author to do the research so that my assertions in this lunchtime series have more of a ring of fact rather than of mere musings. Market your invention with Microbusiness Independence. I'll have to add those last two to my reading list. If you haven't already read it, another book you might like is "Indian Givers: How the Indians of the Americas Transformed the World." Crops developed by native americans had a tremendous effect on the world because of their higher calorie and protein output. Looking forward to the lunchtime series. Lisa and Bob --- I'll add both of those to my reading list. Thanks for the recommendation! As I was reading Against the Grain, I started drawing a lot of conclusions about the relationship of the advent of agriculture to the Bible, so I'll be curious to see what a real scholar has to say. And I should add that I'm always intrigued by Native American farming. Hmm, I'm adding "guns, germs and steel" to my reading list. Even while it's not mainly concerned with agriculture, I've found Bill Bryson's "A short history of nearly everything" a very interesting overview of general science history. I've enjoyed several of Bill Bryson's travel books --- I'll have to put his A short history of nearly everything on my list! The scholarly consensus on Diamond (not that you're obligated to care, I just thought you might be interested ), is that he over-simplified his argument to sell lots of books. Which, in fact, he did -- sell lots of books, that is -- so maybe it's just sour grapes from historians whose books sell 3 copies. He also touched off an absolute wave of other popular macro-histories and commodity histories that look at the implications of one idea or object or phenomenon on world history (sugar, salt, tea, etc.). This trend ran alongside popular histories like "How the Scots Saved Civilization" or "How the British Navy Shaped the World," etc. -- all perhaps overly deterministic, although some certain more so than others. That's probably my biggest objection to Diamond also, and I think he doesn't sufficiently consider the role of human agency and culture. But I think he's fun to read. The idea of the macrohistory came out of the French Annales school. The most famous is probably Braudel's The Mediterranean. If you're interested in macrohistory / global systems / commodity histories, there's a texbook I like -- The Human Web by somebody or other McNeil and also Sweetness and Power by Sidney(?) Mintz about sugar and economic development and the plantation agricultural system. Heather --- I thought I remembered you saying something about Guns, Germs, and Steel, but couldn't remember what. I really appreciate you taking the time to post the whole story. I hope you'll point out any oversimplifications as they relate to my own conclusions in the series. And thanks for the other book suggestions!